The Flash introduces another of the Bus Metas as Barry becomes obsessed with getting the upper hand against DeVoe. With this being the first episode after Barry it’s reasonable to consider the overall impact of having him in prison over the past few episodes. Unfortunately there are little to no meaningful consequences for the show or the other characters. Barry blends seamlessly back into his old life without missing a step and the plot carries on as if his imprisonment had never happened. The only exception is that he’s on an indefinite leave of absence from his day job because his co-workers and the Mayor are wary of him. In theory this is a good character story as Barry still has something important in his life taken away from him by DeVoe but in practice it has very little impact at all. At this point it’s questionable why Barry even has a day job considering the resources at his disposal thanks to inheriting them from Eobard Thawne as Harrison Wells. Even if he stays there because he likes doing that job then the show has done very little to develop this part of his life meaning the loss of it is meaningless to the audience. As a slight aside, I predict that the Mayor will end up being some sort of villain eventually. The reasons for Barry’s suspension are intriguing because they offer a snapshot of what life is like in a world where Metahumans exist. How this is addressed is very heavy handed as terms like “fake news” are thrown around but the idea that people no longer take things at face value because pretty much anything appears to be possible at this stage is a strong one. The public don’t accept that DeVoe is actually still alive so it will take time for people to actually believe it. As with most things on this show this is entirely surface level and only serves as a stumbling block for Barry rather than being a serious attempt at world building. This episode very much feels like a typical season 4 episode as it features a new Bus Meta and has Team Flash trying to outwit DeVoe once again. 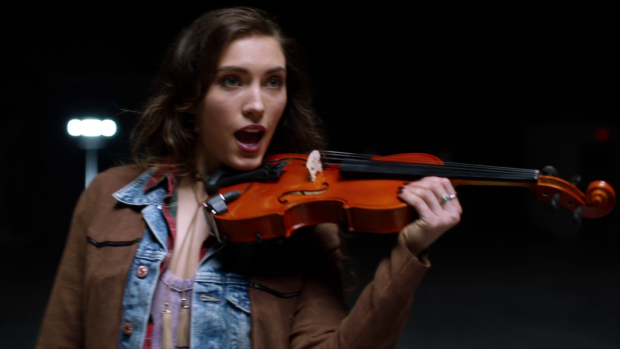 The Metahuman is Izzy Bowin aka Fiddler (Miranda MacDougall). She has been gender flipped from the comic book version named Isaac Bowin and has the ability to weaponise sound waves. It’s a cool power and visualised well while also supplying some much needed hope for Team Flash to take on DeVoe. She manages to hurt him purely on instinct which encourages Barry to train her to help in the inevitable conflict. 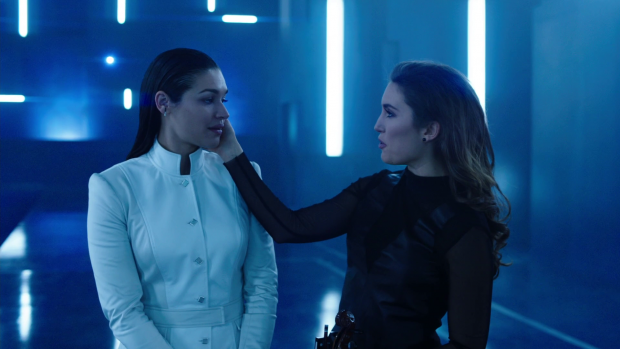 As characters go Izzy is far from memorable because the episode doesn’t spend an awful lot of time exploring who she is as a person and what motivates her. It is mentioned that she wants to be normal and is happy using her powers to further her musical career. Not wanting to be a hero is an interesting angle that was rife for further explanation but the episode relegates it to a background detail that is ultimately unimportant. All it takes is a pep talk from Ralph to inspire her to use her powers for the greater good and her contribution becomes a by the numbers training opportunity for a potential new member of Team Flash. It really is a shame because Izzy had the potential to be a really good character. 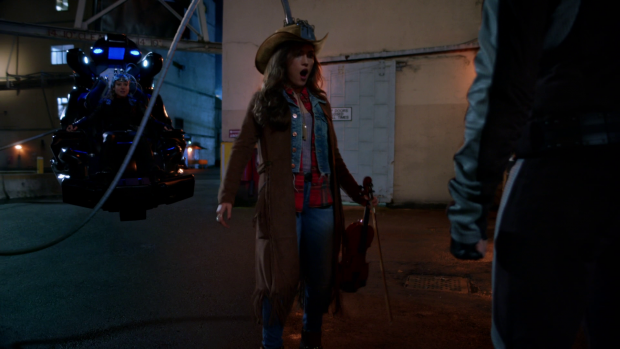 Miranda MacDougall has a lot of charisma despite her over the top accent and there were moments where she presented a verbal challenge to members of Team Flash showing that there was a fun dynamic there that the writers chose not to play with for some strange unknown reason. Her “death” is ultimately underwhelming because there was very little reason to invest in Izzy it happened. Constant references were made to some sort of connection between her and Ralph and the idea that they were both misfits not interested in being a hero thrust into this world with little choice in the matter was a strong idea. The commonality was clear but it remained unexplored because the episode was more interested in burning through plot at an extended rate to get to the end point. Hartley Sawyer does sell Ralph’s grief really well which makes up for some of this but there’s no substituting for actual character development. 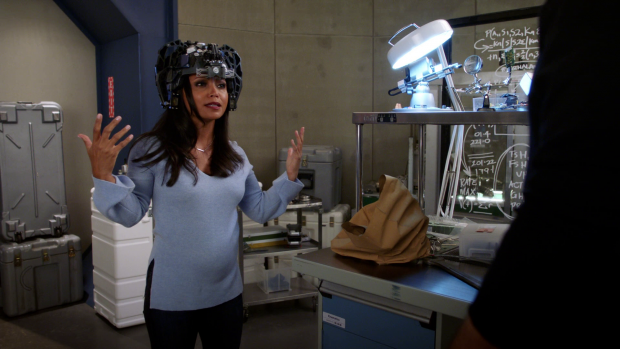 Izzy does represent Barry struggling with how to deal with DeVoe. It’s implied that being forced to take a leave of absence preys on his mind and causes him to become laser focused on bringing down DeVoe. This means that he becomes obsessed with training Izzy and tries to cut corners until his efforts accidentally hurts her. There is a sense that he’s trying to see the bigger picture and take steps to ensure victory but his approach forgets that there are people involved and that he has to consider their limitations before pushing them too hard. It’s very much an Oliver Queen approach to solving a problem which hasn’t really worked for him. As with everything Barry learns his lesson quickly and nothing really comes of it. This show is becoming known for lazy and shallow attempts at characterisation and this is a clear example of that. DeVoe as a villain is all over the place. I criticised the previous episode for his actions not making sense and not much has changed this time out. The question of why he needed to switch bodies was answered here at the very least though it’s not very compelling. I do like the idea of DeVoe having to constantly switch bodies because his intellect can’t be contained by one for very long but there is no sign that anything interesting will be done with this. It’s also inconsistent with earlier behaviour as Dominic’s body seemed to be a good fit for him since he was in no rush to find a replacement. Was Dominic’s body stronger? If so why not stay in it? It’s also unclear why he wanted Barry to come back and create the Bus Metas and what he plans to do with all of their powers once he collects them all. This can be explained away as his plan not being revealed quite yet but the hints we have been shown have no room for interesting speculation of any kind. At this point I’m inclined to believe that DeVoe is acting at random and has no plan at all. His actions could make no sense because they’re not supposed to make sense though I suspect that this won’t be the case. 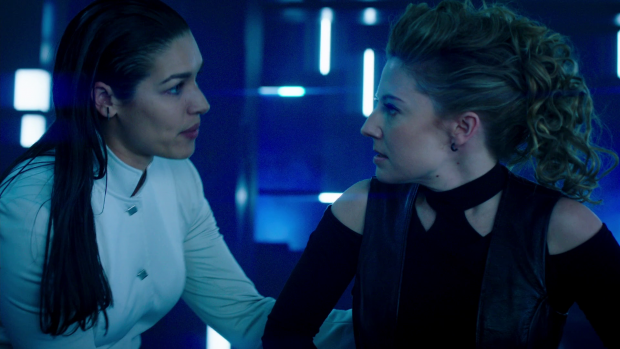 Another missed opportunity was to do anything meaningful with DeVoe being in Becky’s body. Sugar Lyn Beard’s performance was as good as it could have been considering how little she had to work with. At this point DeVoe is devoid of nuance and comes across as an unhinged maniac which Sugar Lyn Beard is very adept at selling but there’s no character under there. There are further hints at Marlize being uncomfortable with the overall situation though it doesn’t go anywhere either. There’s a compelling story idea involving Marlize dealing with the fact that her husband keeps changing bodies that the show is failing to explore. DeVoe being in the body of a woman should be addressed from Marlize’s point of view because it’s very possible that she isn’t attracted to women which would obviously hurt the relationship. Even if she is then there could be an element of discomfort with the fact that DeVoe is literally no longer the man she married. There will most likely be a point where she decides to betray him but based on current efforts it will feel unearned when it happens. DeVoe’s collection of powers aren’t used to great effect. With all the powers he/she has collected he should basically be unbeatable as he can manipulate luck, control technology, both read and minds as well as shrink things. Considering his/her considerable intellect it shouldn’t be possible for Team Flash to win and the fact that they aren’t instantly defeated is a testament to lazy writing. Izzy’s “death” by body hijack was so awkwardly handled as there was plenty of opportunity for Barry to intervene. The best part of the episode was the subplot involving Cecile and Harry. They strike up a really fun dynamic when Cecile opens up to him about hearing Joe’s dreams and being unable to sleep as a result. It’s an amusing problem to have and acts as an excuse to explore Barry’s ongoing frustrations. It all happens very quickly but all the bases are covered such as his fractured relationship with Jesse, the inability to come up with a way to stop DeVoe and his general salty attitude getting in the way of him forming meaningful connections. Cecile’s mind reading ability amusingly lets her get to know Harry really quickly and help him get out of his self imposed funk. There are some genuinely funny moments in this plot such as the prototype cerebral inhibitor being too heavy to be comfortable and the sped up brainstorming session aided by telepathy. I’d like to see more of Harry and Cecile bouncing off one another so hopefully this friendship will become more prominent in future episodes. An underwhelming episode that feels very by the numbers in the way it introduces a new character only to have her lost to Team Flash in the space of a single episode. Izzy is never given the opportunity to become interesting because the episode isn’t interested in developing her character beyond the superficial. She does seem charismatic and her connection to Ralph is interesting enough but the lack of development makes this another wasted opportunity. DeVoe continues to be an ineffective villain. He/she has access to a collection of powers that should make it impossible for Team Flash to win yet they are able to escape relatively unscathed. The whole idea of bodies being used up is reasonable enough but it’s inconsistently handled. Cecile and Harry’s dynamic is a lot of fun to watch and allows Harry to receive some much needed focus.